Oh, hey. Remember me? I’m baaaaack. I just had a few things to take care of, like move back and forth between Israel, New York, and Massachusetts a few times. Oh, and have a baby. Who is now a toddler. Time flies, huh? But I never stopped cooking. I was roasting chicken with an infant strapped to me and making peanut butter cups during nap time. I now excel at making scrambled eggs one-handed while a twenty-something pound child rests on my left hip. 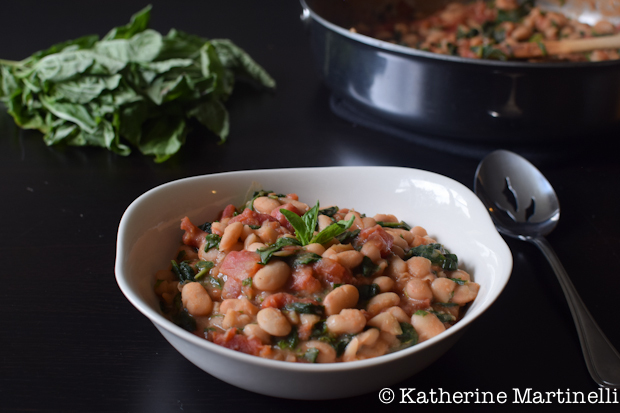 And I’ve increased my repertoire of quick, easy meals like these White Beans with Spinach and Tomatoes, which are ready in just 10 minutes! Who doesn’t have time for that? We’ve become obsessed with white beans lately. My husband went on a “slow carb” health kick for a while, which is a little bit paleo, a little bit low carb, but it allows legumes – thank goodness! I’m not big into diets but I’m always up for a challenge and enjoy eating healthy. So I came up with this recipe, which is an amazing gluten free side or base for a meal. I love to roast shrimp and throw them on top, but it would go well with any meat. It’s also hearty enough to be a vegetarian and vegan meal on its own, maybe with a side of roasted cauliflower (another obsession of mine). This dish is packed with protein and garlicky goodness, not to mention spinach, tomatoes, and fresh herbs. It all comes together in a single skillet and requires very little chopping or prep. It’s also pretty perfect year round, though if you can get garden fresh herbs in the summer it’s that much better. 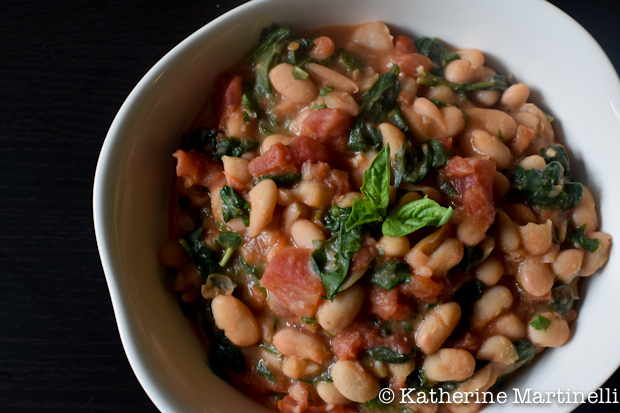 Use cannelini or great white northern beans. If you’re feeling like something slightly richer, add some freshly grated parmesan. 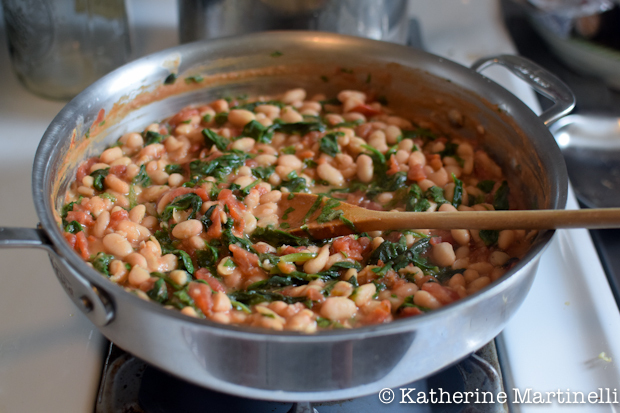 This garlicky, gluten free recipe for white beans with spinach and tomatoes is ready in under 15 minutes and makes the perfect side dish to any meal. Add the garlic and sauté for a few minutes until aromatic; do not burn. Add the beans and toss to coat in garlic and oil. Add the spinach; cook until wilted, about 2 minutes. Stir in the tomatoes and bring to a simmer. Remove from the heat and stir in the basil, parsley, and salt. Serve. Welcome back! I’ve missed you. So happy to see another recipe from you. And what a dish you’ve made for us! Love this combo of ingredients, and such a nice warm weather dish. Really it’s a complete meal. Thank you! So lovely to see you pop in to update the blog! The stew looks very satisfying and delicious. Welcome back! Congratulations on your growing family. What a lovely comforting recipe. Great to see you back. Many congrats to you for your baby boy. And love this simple comforting dish. Welcome back, Katherine, and congratulations on your new addition! He’s adorable. I love this bean dish too. Great flavor combination! Congrats on your son! Glad to have you back! Pinning and sharing this one…. I missed you and your blog- Welcome back to the states,congrats on your little one, and thanks for a great recipe. I was going to start a low carb diet today- maybe I’ll start with slow carb like your husband. I don’t usually like white beans, but this was incredible! Great for a simple, quick meal.